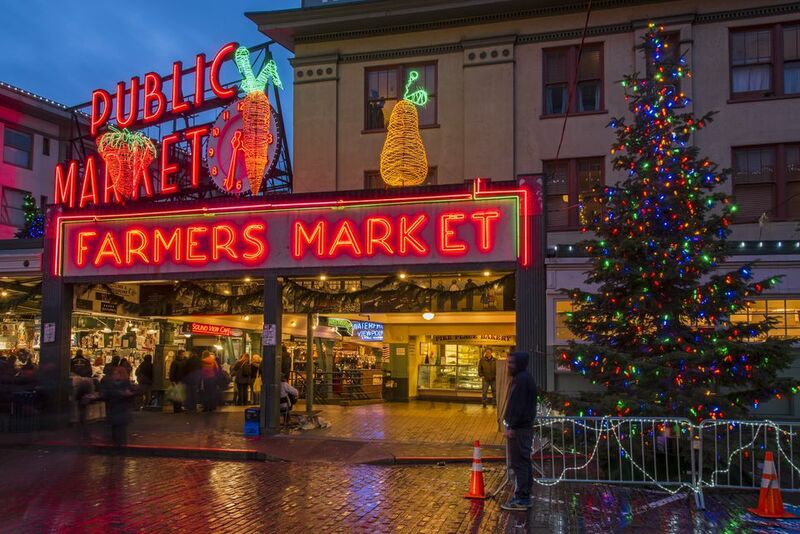 If you're visiting the Pacific Northwest this November and December, you'll find plenty of ways to celebrate the holiday season no matter where you go, but the city of Seattle hosts some of the best Christmas events in the region. From annual festivals, concerts, and shows to dazzling lighting displays and Christmas villages, you're sure to find something to put you in the Christmas spirit on your trip to Seattle this year. From Wildlights at Woodland Park Zoo to Zoolights in Tacoma, the Seattle area's Christmas light displays open up the day after Thanksgiving and remain open until the New Year. While most displays in the area are walk-through, you'll also find plenty of nearby attractions you can drive through instead. Additionally, many of the area's largest lighting attractions also offer festive events, holiday markets, and Christmas performances throughout the season. One of the best places to celebrate the holiday season in Seattle this year is the Enchant Christmas attraction that will be set up at Safeco Field — home of the city's Major League Baseball team, the Seattle Mariners — from November 23 to December 30, 2018. The main attraction at Enchant Seattle is The Great Search, which is boasted as the "world's largest Christmas light maze" and takes up the majority of the baseball field. With the price of admission, you can also enjoy access to a skating rink, holiday market, and visits with Santa and Mrs. Claus as well as special concerts, shows, and events throughout the season. A beloved tradition for over 25 years, the Sheraton Seattle’s Annual Gingerbread Village, which features confectionary sculptures created by some of the city's top architecture firms, builders, and culinary teams. This year's theme is "Welcome to Whoville!" and will feature a reconstruction of the entire snowflake setting of the Dr. Seuss book and 1966 animated classic film "How the Grinch Stole Christmas." Gingerbread creations will include the central square of Whoville and the Grinch's home on crumpet mountain. The 26th Annual Gingerbread Village will be on display in the lobby of the Sheraton Grand Seattle from November 20, 2018, to January 1, 2019; proceeds from the event will benefit the Juvenile Diabetes Research Foundation. The Seattle Center—a 74-acre arts, educational, tourism and entertainment complex—hosts a month-long celebration called Winterfest every year from the day after Thanksgiving to early January. Featuring ice sculptures, student showcases, a miniature winter train village display, an ice rink, and plenty of events and attractions for all ages, Winterfest offers guests plenty of ways to celebrate the winter holidays. Winterfest will kick off on November 23, 2018, with "Holiday Harmony," a four-part a cappella group performance of holiday carols, and continue with a host of events, concerts, and activities—including a New Year's firework display—until its conclusion on January 6, 2019. On the day after Thanksgiving (November 23, 2018), Macy's Seattle rings in the holiday season with its annual Holiday Parade and star lighting event. Festivities begin at 9 a.m. with the parade, which runs in a loop through downtown Seattle starting at 7th Street and Pine Street. In the evening (at around 5 p.m.), the giant star hanging on the Macy's storefront at 300 Pine Street will be lit for the first time of the holiday season; a fireworks show will take place just after dusk if the weather allows. Westlake Park—located just a little further downtown from Macy's on Pine Street—is the home of Seattle's official Christmas tree each year. On the day after Thanksgiving, you can enjoy an evening of festive holiday activities as you watch the tree light up for the first time of the season. The event kicks off around 4:30 p.m. with the tree lighting and will also feature special musical performances by local bands and choirs as well as visits from Santa Claus (fresh off his Macy's Parade float). The annual holiday market will also open for the season during the event and will be open on select dates until December 23, 2018. Bellevue Collection is a shopping center in northeast Seattle's Bellevue suburb that hosts a series of events each holiday season, including a nightly parade down Bellevue Way. Known as Snowflake Lane, this festive district offers guests access to over 180 stores, a full line-up of holiday events, and plenty of Christmas decor perfect for family vacation photos. The Snowflake Lane parade will take place every night at 7 p.m. from November 23 to December 24, 2018. Along with the block-long parade, the event will also feature fake snowfall, dazzling lights, dancers, and festive musical performances.